MOTORISTS approaching Otavi from the north are warned to take caution after a horrible accident earlier this afternoon caused an obstruction on the main road on the outskirts of the town. 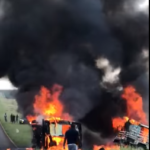 Several people died a horrible death while being trapped inside the burning wrecks of two minibus taxis that burst into flames after the two vehicles crashed head-on into one another. Members of the emergency services are still busy cleaning wreckage from the crash between a Toyota Quantum and an Iveco that are causing an obstruction for vehicles on the road. The number of people that were burned beyond recognition is not yet known. Some of the passengers of the two vehicles survived the crash and were receiving medical treatment on the scene while they waited for ambulances to transport them to medical facilities. The horrible accident occurred on Sunday afternoon just a short distance from the bridge over the railway tracks on the way to Tsumeb on the B1 highway.